Chateau / Country House2583 sq. ft.
Finca Bilou has five double rooms, each with a bathroom en suite, with a contemporary, attractive interior. All rooms have soap & shampoo facilities and a hair dryer, coffee & tea facilities, ceiling fan, central heating for the cooler winter evenings (surcharge), free wifi and safe. The rooms are located on a courtyard, where you can enjoy the great outdoors under the almond tree with the beautiful mountains in the background. Relax with a book or easel on the large roof terrace, which offers a beautiful 360 degree view of the surroundings and the sea. Relax in the jacuzzi (not heated) or take a refreshing dip in the pool. The general living room has a flat screen TV with cable TV, DVD / CD player, dining area and then the 6th bathroom with a separate toilet. From the living room you enter a fully equipped professional stainless steel kitchen with a gas stove (3 burners), oven, microwave, coffee maker, kettle, toaster, fridge and a dishwasher. Outside is the bar and there are also two BBQs (coal and gas (gas bottle surcharge)). Garden with almond trees, olive tree, fig trees, pomegranate tree, palms and various plants, parking for up to 4 cars, plot is detached and fenced. Our rural Finca is located 2 km outside the authentic village of Aigües and only 12 minutes from the beautiful beach of El Campello. In addition, the bustling city of Alicante with its large and spacious boulevard is just a 20-minute drive from Finca Bilou and the nightlife of Benidorm is only 30 minutes away. For the active guests among us, golf resort Bonalba is close by and you can make beautiful cycling and hiking tours directly from the accommodation. You can occasionally meet the owners of Finca Bilou and living next to the Finca, on the grounds to maintain the garden and the swimming pool. This is in the interest of all guests so that you can enjoy them all. Of course, your privacy will be taken into account and we will mainly do this work if you are absent for a short while or at a time agreed with you. We are proud of our beautiful accommodation and therefore want our future guests, friends and family to enjoy our hospitality and service and maintenance is desirable. Where would you rather spend more time: on the golf course, bicycle, beach or museums? Active, relaxed or cultural? . Finca Bilou, just 10 to 15 minutes drive from all desired activities, is the perfect base for your (combi) holiday. We therefore warmly welcome you to use our beautiful Finca. Our love for Spain started by visiting family in Barcelona, Spain. Shortly after the family visit and only being 18 years old, I Birgitta moved to Spain and started my career in the travel & leisure industry focusing on the Costa Brava and the Costa Daurada area. My time spent in Spain allowed me to appreciate the Spanish culture, become fluent in Spanish and to enjoy the Spanish lifestyle and cuisine, including the fantastic local wines of course. After a search of one year we have lost our eye on what is now called our "Finca Bilou". This Finca meets all our requirements and we also hope it meets yours. Quiet rural location and yet close to all the entertainment and beautiful sights that Aigües, Alicante and the Costa Blanca have to offer. - Directly beautiful hiking and cycling opportunities from the Finca. Golf resorts and tennis courts just steps away. - Fully fenced area with almond, pomegranate, olive and fig trees which provide us with homemade fig jam, pickled olives - Relax with a nice book or a nice glass of wine on the roof terrace overlooking the mountains and the sea in the background. - Nice climate where this region is known for. 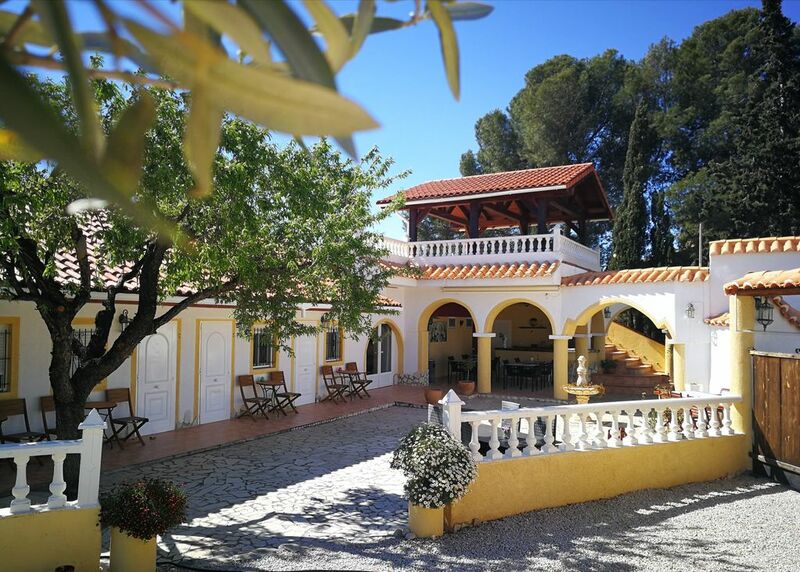 Did you know that besides the self catering possibility our Finca Bilou is also very nice to rent with a group of friends, family, cycling, hiking, yoga, motorcycle or golf club including a breakfast buffet for a week, midweek or long weekend. (for options and prices please contact us.) The whole Finca for yourself but without hurry in the morning. Everyone a private room with bathroom en-suite, BBQ facilities, table tennis, relaxing by the pool with built-in jacuzzi (not heated) and on the edge of the cozy authentic village of Aigües with terraces and a few small eating places, We are proud of our beautiful Finca Bilou accommodation and we want our guests, friends and family to experience our great hospitality and service. Föhn & Soap dispenser with shampoo & bath foam present in the 5 bathrooms. 1 Cot + bedding (0-2.5 years) & a high chair are provided. Please notify this in advance when booking. The house is safe for small children. Towels, Tea & kitchen towels are included in the price. Beach towels can be rented on site at € 7.50 pp per week. Breakfast service can be requested. Roof terrace is equipped with 6 XL sunbeds. Please do not move it downwards i. v.m. any damage. We have contacts with two good masseurs. If you want to make use of these services, at our location, let us know in time. If you want to rent bicycles, let us know in time. We have a good address here about beautiful race, mountain if both bikes with support and deliver these on the spot and pick up again. An information book with nice tips and facts is available for inspection in the rooms. We are always willing to arrange things. Ask us and we will help you.